While the new regulations may create a more difficult environment to onboard new clients, it hasn’t had much of an effect on profitability levels of binary options trading in Japan. 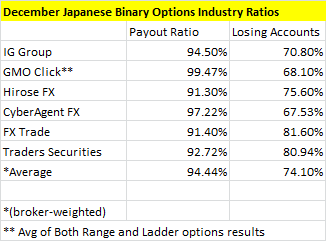 According to account profitability and average payout figure reports issued by Japanese brokers offering FX binary options, December numbers were similar to those of November. In IG’s case, they experienced one of the largest changes for the month as losing accounts rose 4.7% to 70.8%, as average payouts fell to 94.5% from 99.1% in November. On the other side, CyberAgent FX saw their clients become more profitable with 67.53% of losing accounts during December, compared to 74.21% in November. Helping the figure was a rise in average payouts to 97.22% from 92.68%. Among other brokers, GMO Click traders continue to experience the highest payouts with an average of their Range and Ladder option results calculating to 99.47%, with Range options reported as slightly above 100%. The Range options results represent that the broker netted a loss on trades in those products.